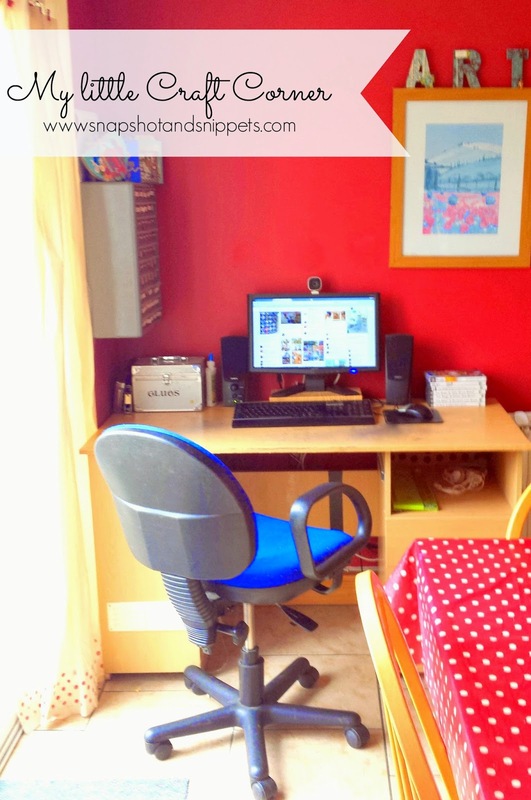 Ahh, I remember the halcyon days of having a craft room to call my own. They are long gone now and I am now reduced to a corner of the kitchen. Due to space restraints and the fact the needs of the many outweigh the needs of the few or me to be precise. But that didn’t mean I could just let my stuff become a mess. In fact, it meant I needed to sort it out even more. Suddenly my things were was front and center and not behind closed doors. My aim is to have this kind of gorgeousness from Chelsea over at Two Twenty One go check it out it is just the nicest space. But for now I am stuck with what I have and I will take you through how I manage in my little corner . Actually ask my husband and kids I am sure they will say I have quite a big corner! and the computer of course. My crochet and wool is actually in the living room for now as that’s where I do that kind of thing. 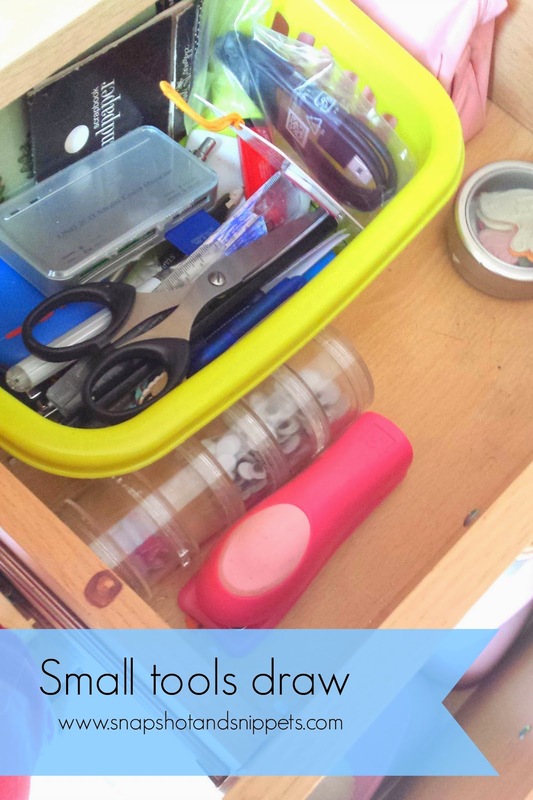 I have had this drawer unit for ten years since I started scrap-booking it is one of the best investments ever made as it has all my fiddly embellishments in it. The bottom drawers have the buttons. 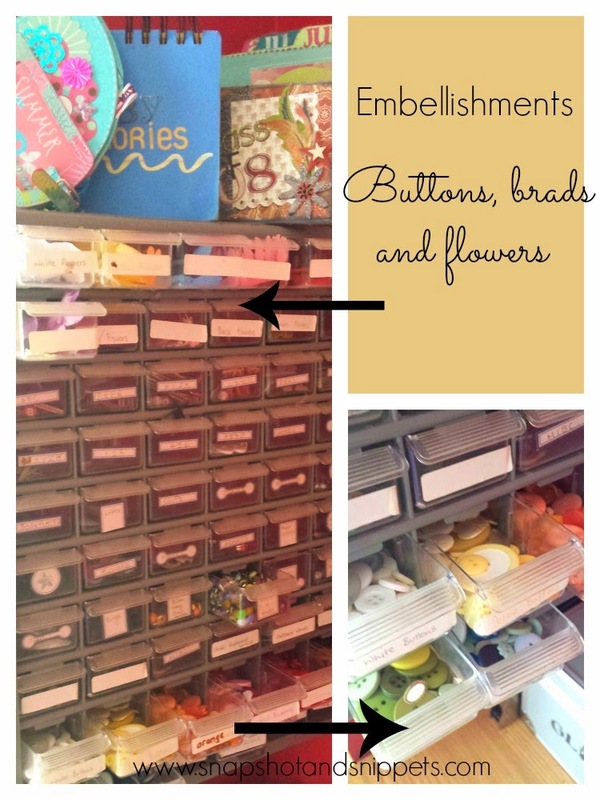 The flowers, brads, and buttons are sorted into colours. All the drawers are labelled to make life easier. It is not the prettiest but it is definitely practical and the top is decorated with mini albums I have made which I change seasonally so my summer ones are up there at the moment. 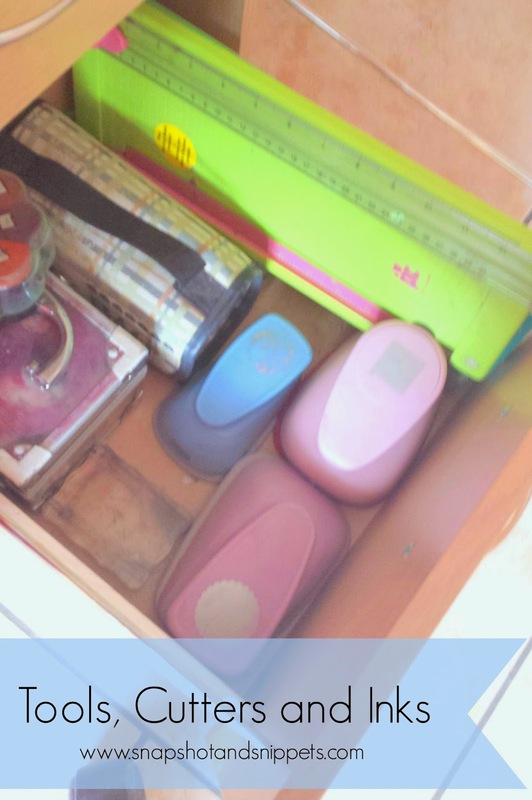 I have two drawers which have my most used tools so my cutters, inks, scissors, craft knives and pens etc. So I can grab my craft supplies quickly. I do have other tools stored in my dresser, like my glue gun, and heat gun these are things which I don’t use as often. See how I store them Below. My Craft paper and card are stored in an Expedit unit beside my desk. The Expedit used to be sold in Ikea. And Scrapbookers loved then as they stored 12 x 12 paper perfectly. I couldn’t believe it when I heard Ikea were getting rid of the Expedit series. Mind you I have seen the replacement Kallax units and I can not see what the difference is except for the price. Anyone know the difference? Yes,that is Meg’s bed on top of my paper. Meg is our oldest cat she doesn’t do much these days except sleep and eat. Up there she is safe and it is by the radiator, so in cat heaven. 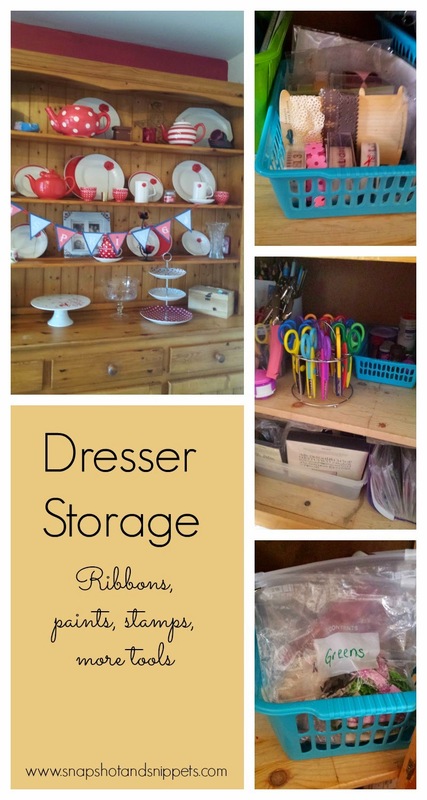 What Craft supplies are stored hidden away? I wish it was prettier but again budget and lack of time was a factor. But that does have the behind closed doors bonus so that is handy. Once the dresser doors are shut it is pretty again. 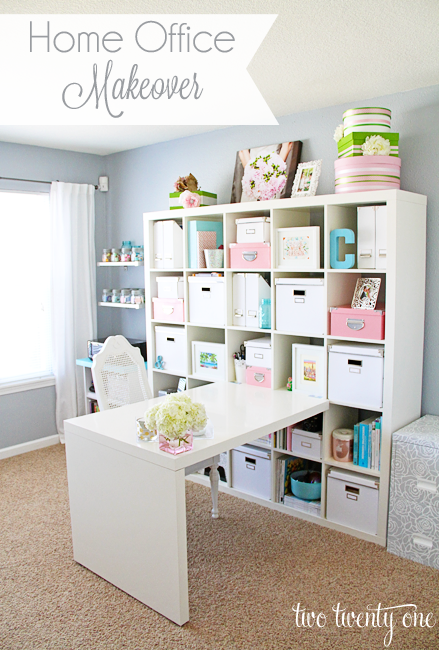 If you liked this post check out my other Organizational and cleaning posts here. Or sign up for my Snapshot and Snippets newsletter for more hints and tips and exclusive recipes. it is always important to stay organized. I love the wall decor, so bright and cheery! So jealous of that organization! Its my downfall I am working on! 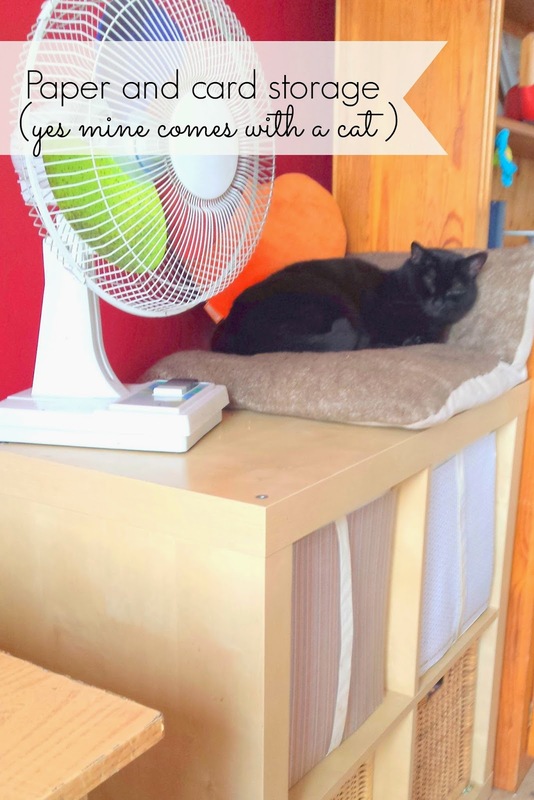 Stopping by from the June Blog Hobnob link up! Nice to "meet" you!